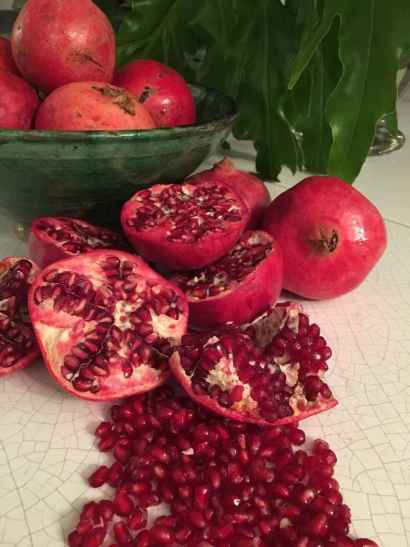 Delicious pomegranates! Sparkling ruby jewels of the fruit world… Vibrant red seeds full of nutrition – antioxidant rich, high in fibre and Vitamin C. May marks their last month in season – but there are still plenty available this week, so grab a couple when you’re at the grocer before they’re gone for the year. I love using them wherever I can… They are the perfect finish to the top of a pav, and are a great addition to savoury dishes as they give such a great contrasting taste & texture. They can also dazzle up a simple glass of sparkling water. Just drop a few seeds in and watch them dance amongst the bubbles! Because they are such a winner in salads, I’ve included them in this wholesome recipe which combines them with brown rice, roasted veges and fresh herbs – it’s really the perfect kind of salad for this time of year. Serve as a side dish or devour on it’s own! Simply mix all the salad ingredients together in a large bowl (except for the goats cheese). Then in a separate bowl, mix ingredients for the dressing until well combined, pour over the salad and toss until everything is well coated. Add your pieces of goats cheese on top to finish and that’s it! 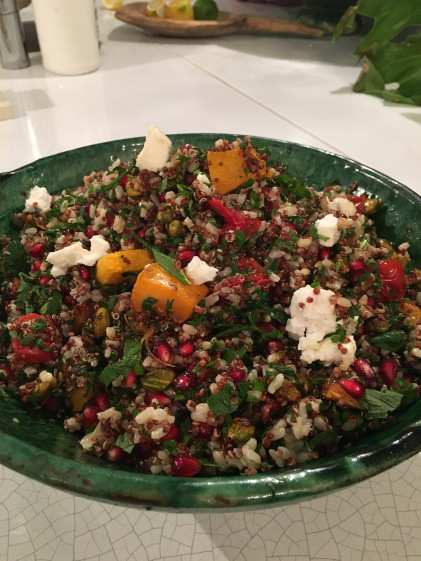 A really yummy, and healthy way to use the last pomegranates of the season – enjoy!